By buying this product you can collect up to 484 bonuspoints. Personvagn 1:a klass typ Aüm 203 DB, längd över buffertar 28,2 cm, epok IV. 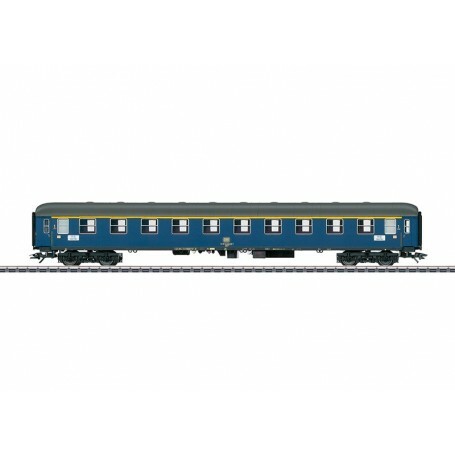 Type Aüm 203 Express Train Passenger Car	Model: The car has a blue paint scheme, as the car looked starting in 1963. The running gear is prototypically detailed with a reproduction of brake shoes and generator drive. The car has unlighted red marker light inserts on the ends. The 7319 current-conducting couplings or the 72021 operating current-conducting couplers as well as an interior lighting kit (73400/73401) and the 73406 pickup shoe can be installed on the car. The minimum radius for operation is 360 mm / 14-3/16'. A decal set is included. Length over the buffers approximately 28.2 cm / 11-1/8'.DC wheel set E700580. Prototype: German Federal Railroad (DB) compartment car, 1st class, type Aüm 203, UIC-X design. The car looks as it did around 1975. One-time series. This car can be combined with the models 43907, 43908, 43909, 43933, and 43952 to make a typical Era IV express train set.